Imagine a little Dutch boy not interested in skates or leaking dikes. No, this little guy got a plastic scale model for his birthday and boy, is he happy with it. Into the wee hours of the night he is studying, assembling, painting airplanes, ships, tank, little toy soldiers. This little Dutch boy and his friends start dreaming of going to school in a Willys jeep. As they grow older they no longer spend their pocket money on scale models. They have discovered that on flea markets you can buy the real thing. Helmets, bayonets, jackets, insignia. Scale 1:1 is the new thing. It is the start of a collection of uniforms and equipment of world war 2 in which the U.S. Army seems to hold the greatest fascination. For a time these Dutch guys learn all there is to know about fabrics, zippers and buttons as used for U.S. Army uniforms in the forties. And slowly their interest begins to shift to when and how these uniforms were used, and to the guys that wore them. Hesitantly they put on some uniforms themselves in May 1995, on a grand commemorative tour to celebrate the liberation of Holland. And what do you know there's many more young people doing the same, driving restored world war 2 vehicles. We meet up with new and old friends to start a living history group. By chance we pick the 36th Infantry Division as our theme. And our interest in 'our' unit grew with every bit of information discovered. To such an extent that we decided to travel to France to meet up with veterans of the Fighting 36th on a battlefield tour. A little nervous while waiting in the hotel lobby in Epinal since we were not sure what those veterans would think of us. Well, we need not worry since most of them thought it was just great. And I guess it must be kind of special; you thought you were all forgotten and here are couple of nutcases from Holland wearing your old GI uniform with your old unit insignia, the T-Patch. We had a wonderful time and got lots of stories. We even got to take four of them up that fateful hill of the 'Lost Battalion' up near Bruyères in the Vosges Mountains in our restored jeep. 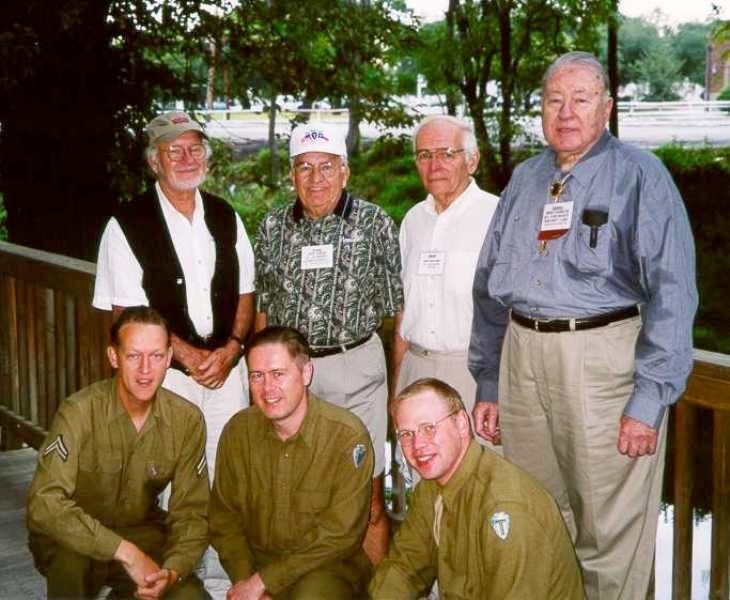 Last October all those old soldiers whom we met in France were there to meet and greet us at the lobby of the Four Points Sheraton Hotel where the 75th reunion of the 36th division was happening at San Antonio, Texas. Morris Courington, Cewin Johnson, Wayne Kirby, Bob and Betty Peiser. Marty Higgins was there too. He came to Holland two years ago to see us, would you believe it, since we picked his old unit for our reenactment theme. Three of us had managed to travel to San Antonio for the occasion. Harry van de Bogert -a.k.a.- Harry 'Bugs' Bogart, Cor Geluk -a.k.a.- Cornelius 'Lucky' Glueck and myself, Frank de Koning -a.k.a.- Frank King. Pieter Oosterman of course should have been with us but he had obligations at home. So it goes. We were wearing our dress uniforms as they seemed more appropriate at the 'home front' than our combat rags. And what a welcome we received. Al and Berdie Dietrick took us on a luxury 'night patrol' of San Antonio in their van. Merle McGinnis bought us beers, others squabbled over who was allowed to pay for our breakfast. Incredible. They made us feel like stars whereas the veterans were of course the real stars. And for us it was all very special. 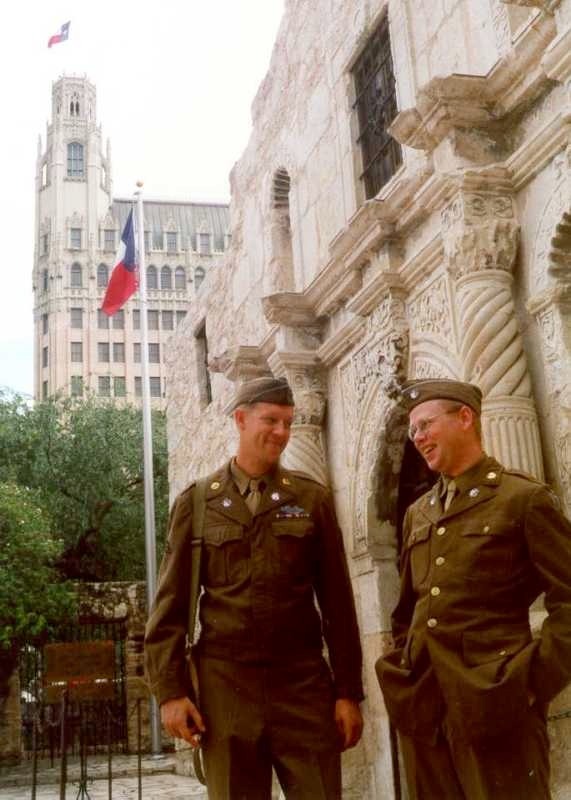 Like walking the streets of old San Antonio dressed as 1944 GI's on leave. We went to see the Alamo (so we can now remember it), enjoyed the wonderful old buildings in the city, walked the River Walk and met lots of people, including veterans enjoying the niceties of downtown San Antonio. Buying stamps at the downtown San Antonio Post Office, across from the Alamo, was like truly going back in time. All it lacked was a couple of war bond posters.At the hotel we were treated like guests of honor by the veterans and their wives and family. 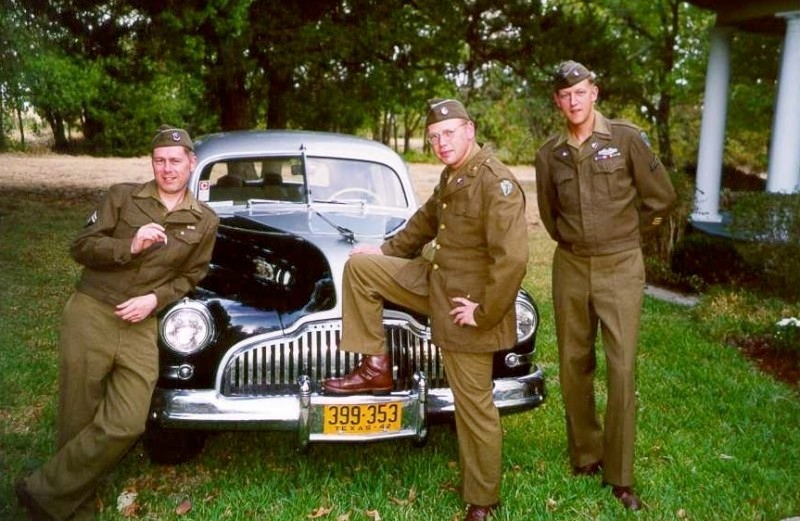 Perhaps seeing us reminded those ladies of what handsome young devils their husbands were in the forties, smartly dressed in their GI uniforms. It was very heart warming I must say and a bit overwhelming at times. But all in all great fun. Not only veterans attended the reunion. 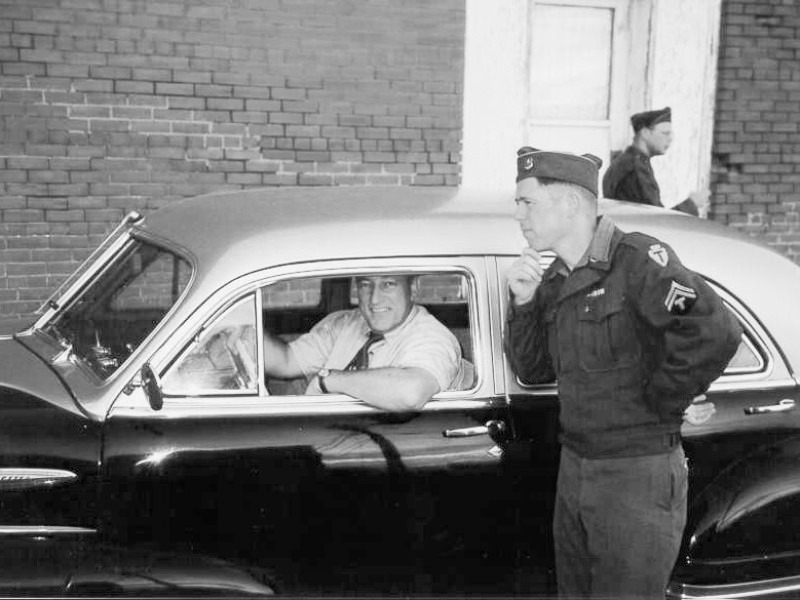 After his father passed away Robert Rittman found some of his wartime letters. He now is trying to find somebody who knew his father, Henry Rittman of H. Co, 142nd Inf., in world war 2. Young Dave Lynema was there with his mom. Her father, his grandfather, now deceased was with the Texas division. Fortunately we had brought some spare uniforms so Dave could dress as a combat GI which he really enjoyed. He's only 20 years old, just like most of the vets were when they fought world war 2, and has a keen interest in history. People like him will keep the memory of world war 2 GI's alive. And I hope we've done our bit too. Our 'corporal Lucky', held a speech calling for veterans who drove jeeps to come forward. Because were we once dreaming as kids of driving a world war 2 jeep, we are now restoring our second genuine wartime jeep. And this time we want to get a Texas Division nickname for it and all the tactical markings exactly right. Saturday morning after breakfast we went to say our good byes at the CP's. I was sorry we missed a few people but we just had to leave as Lucky was flying back the next day. But we did get to say good bye to a lot of people and there was talk of a planned battlefield tour to France June 2001. Some still needed some time to think about going but Ray Wells simply said: 'See you in June'. So I guess that means we have our 'orders' for France 2001.